I have a cat I call Jenibelle. 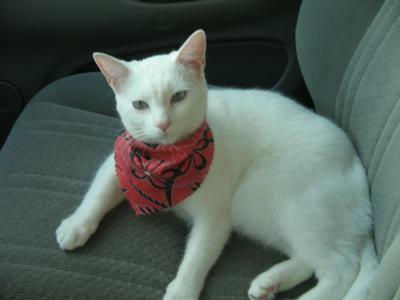 She is a indoor all white cat with blue eyes and she is deaf. I always wanted a white kitten with blue eyes. I found Jenibelle in the Pets section in the Newpaper ad. I drove 10 miles to go get her and I remember her being wrapped in a pink towel wet and smelling of Skin So Soft by Avon. She was a pretty little thing. Now, she is going to turn 3 years old on August 18,2010. When she was a kitten she would jump on top of the vacuum while it was moving. Now she takes rides with us in our truck and looks out the window when we go on short errands into town. Jenibelle used to wear dresses that I would make for her. Now she is too fat to fit in one. Jenibelle drinks lots of water. She loves to look at herself in front of the mirror. Jenibelle's toys are pens, and straws. Jenibelle does'nt socialize with people. Thats ok. When she goes outside wearing her harness she stays close to me. Any movement outside like the grass moving or a butterfly flying by will cause Jenibelle to freeze right in her spot. Sooo funny! She is a blessing to us all. This is Yvonne with Jenibelle.Thanks for sharing your story of Buddy. It is certainly wonderful that you took in Buddy from the horrible Hurricane Rita. You cared enough to help your granddaughter into adopting Buddy to love and raise him in your home. Not to many people think about all the victims in times of bad weather much less gods little creatures.I believe you are a good luck charm to Buddy. Glad to hear that Buddy is your best friend. Wishing you and your family and Buddy all the best in the new year 2011! Well let me tell you about my story about my cat Buddy he is going on 4 years of age and i took him in after huricane rita. It was my grandbabies cat they lost their home in the storm and they ask me to take care of him and i did and that was the best thing ever happen to me i love him like a son his is potty trained very good cat he is my world besides my children. Jenibelle: A real Texas rose! I just discovered this beautiful lady this morning and I had to comment. I have a white cat with blue eyes too, named Star. She would love to go outside but she will not accept a collar or harness and leash so she has to stay inside. How great that you can take her with you in the truck and on outings! I wish I could do that. My friend Suzie takes her black cat Damian on trips in the car too and she doesn't even have to use a carrier to take him to the vet! Such cats are truly amazing. Your Jenibelle is really an exceptional kitty and I'm so glad you shared her story and her picture with us! I had such a wonderful time reading Jenibelle's story. She's so funny! And by the way, that's a pretty name. I never heard it before. I love it that she enjoyed wearing dresses. I bought my cat Mia a dress when she was undergoing radiotherapy (she had a benign tumor removed) and she lost all her hair. She tolerated it for a while. Now that she's totally recovered and her fur has grown back, she has no patience for it! Anyway, I can picture your beautiful Jenibelle wearing her dresses. And I love that she can walk in a harness. My kitties don't like going outside (sigh).